You know I don't buy much nail polish these days. I can generally convince myself that somewhere in my stash is a polish that is similar enough to not needing to buy new ones. So it must be something pretty special when I decided to buy a whole collection. I'm a sucker for collections that have rainbow shades in the same finish, and the Pretty Serious Ghosts of Christmas Future collection is exactly that. A collection of eight strongly pigmented foils with a reflective metallic sheen. One of these colours was already in my collection - Santa's Sunburn. It was released back in 2012 as part of the Christmas without Snow collection. 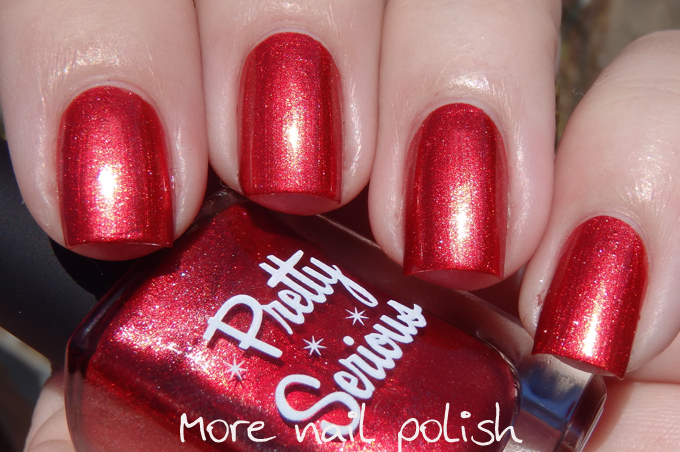 It also made the cut as one of my favourite polishes for that year. So when I saw a whole collection of polishes with the similar finish to Santas Sunburn, but in a rainbow of colours, I was drawn to buy them. These polishes are fantastic for nail art, and I used a few of them before Christmas as can be seen on my Pretty Serious tag. I love them cause they are metallic and shiny and because they are nicely pigmented. I used two coats for all these swatches, most of them were opaque in one coat and applied beautifully, but I like the thickness of two layers. Anyway, lets look at my swatches. First photo of each polish was taken in the shade, second photo taken in the full sun. As much as I love these polishes, I have to say I did have one disappointment with the collection. I had really hoped one of the colours would be the amazing yellow gold polish that Ben and Kaz showed in their blog post titled "Midas has nothing on us!" 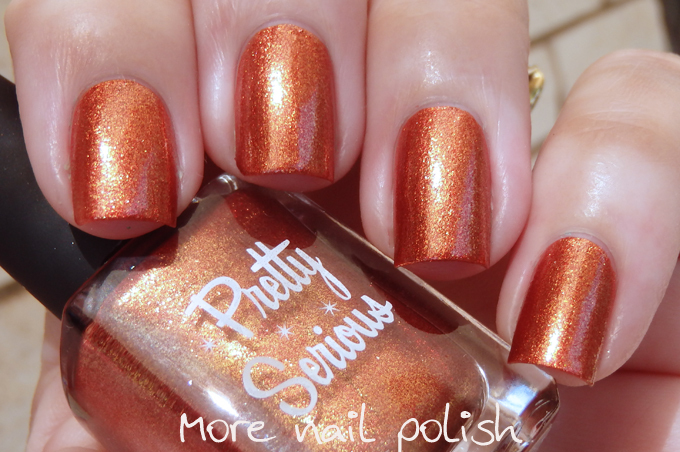 back in March 2013 when they were selecting Seriously Random polishes. They even said then it was a gold version of Santa's Sunburn. So, whilst I love Yuletide of the machines, I kind of wish is was the bright yellow gold rather than having two bronze/orange shades. I'm loving Joy to the Overlords! All gorgeous! My fave is The Night Before! I got the cool colors, have worn Joy to the Overlords...great color/finish!! Eat, drink and assimilate, soooo good.